Northeast Flooring Solutions is a full-service flooring contractor offering removal of existing floors, surface preparation, and new flooring installation. Oftentimes a flooring installation can’t begin until the old flooring is removed and the surface is prepared to receive the new flooring. This is particularly true of resinous flooring systems that need a clean and textured surface to properly bond. Northeast Flooring Solutions understands all kinds of flooring preparation concerns from demolition, floor scraping and removal to the subtle characteristics of what and how the new surface will be applied. These remarkable machines enable us to remove all types of flooring systems including carpet, tile, rubber, VCT, LVT, wood, epoxy, MMA and urethane mortar. They save an enormous amount of labor time on demolition, helping to keep your job on schedule. 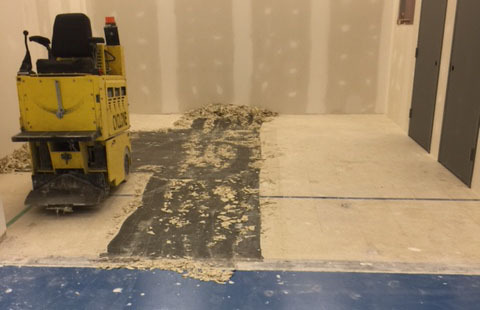 Floor removal is often the first step in our concrete surface preparation process. Depending on your existing flooring surface, and the material that is to be installed, you may need further floor preparation. As part of being a full-service flooring contractor we can also offer shot blasting, grinding, moisture mitigation, and self-leveling as needed. Contact us to schedule floor removal services or inquire about our daily or weekly floor removal machine rental for contractors.